The best reference book for this topic is by K. Mongia et al, titled "RF and Microwave Coupled-Line Circuits". Go to our book review page and order it! 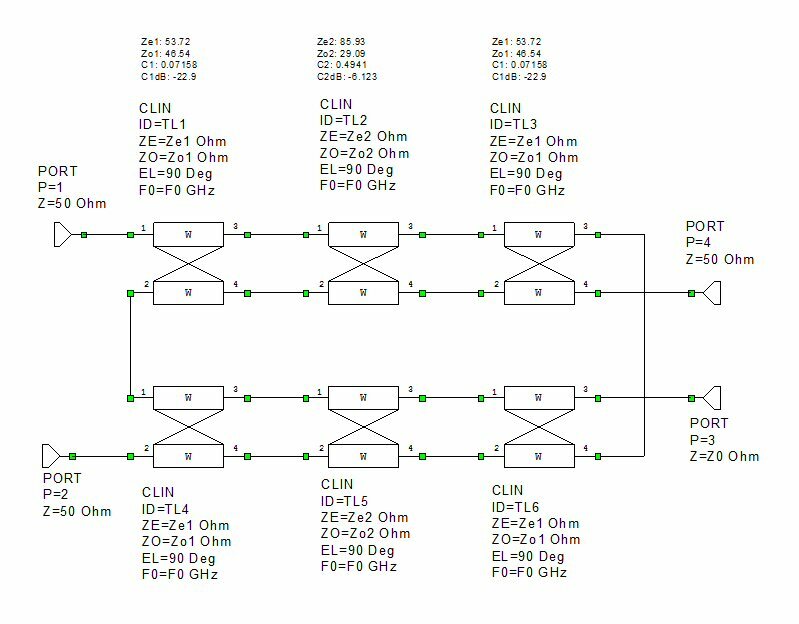 Below, we will explore exact solutions for 3.01 dB three section symmetric couplers. They are "symmetric" in that coupled section 1 is the same as N, section 2 is the same as N-1, etc. They ALWAYS have an odd number of sections. 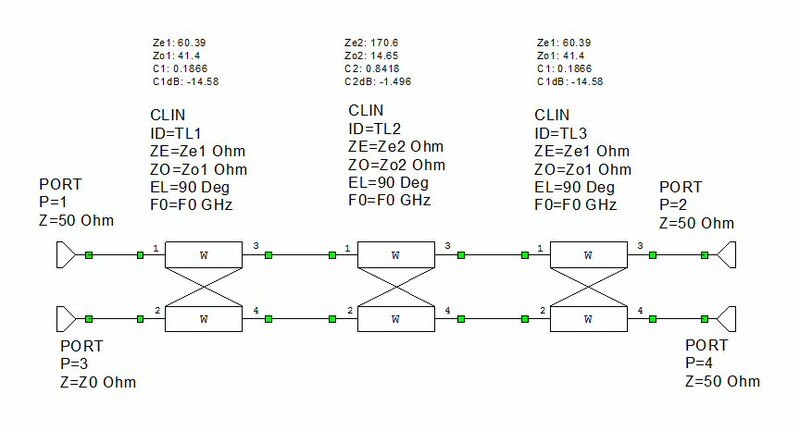 The sections are always the same length (typically 1/4 wavelength at center frequency) or the 90 degree phasing property between the outputs will be lost. We used Microwave Office to make models of three section, equal-split (3.01 dB) couplers, using impedances defined by Mongia; the book has tables of many different coupling values (3.01, 6, 8.34,10, etc) in three, five, seven and nine sections, solved for exact ripple level and bandwidth The tables were taken from prior publications that are referenced). Below, we have typed in the normalized impedances and added equations to "un-normalize" them to 50 ohms and compute the coupling coefficients. The grayed-out numbers have been deactivated... we activated the different ripple values and compared them. We set up the schematic so it displays impedance and coupling values. Did we mention that Microwave Office is a great product? By the way, Mongia did not generate the tables, he referenced them from articles by Levi, Crystal and Young, and Toulios and Todd. All of this work was done before 1965, what were you doing back then? The solutions are "cumbersome" according to Mongia, and won't be attempted here. Nowadays you can obtain the solutions using an optimizer, like we did in the final example below. The tables include exact calculations of bandwidths. 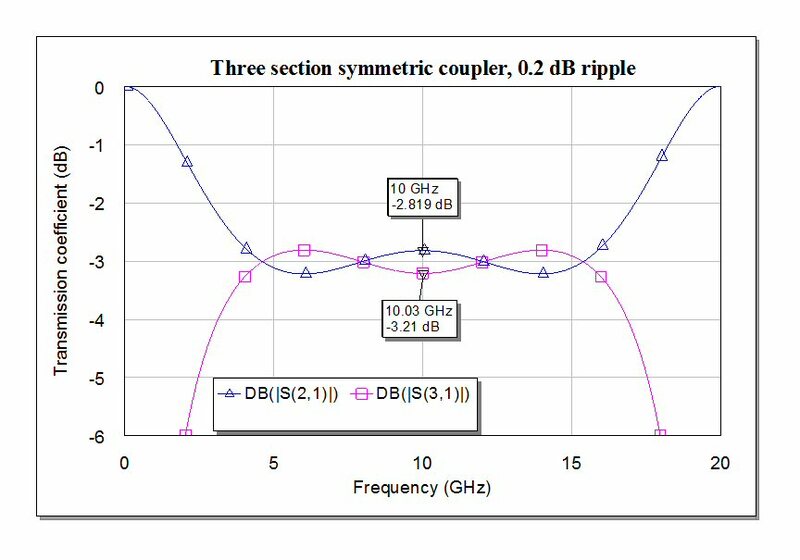 Below we activated the 0.6 dB ripple coupler and show the impedances/coupling coefficients in the schematic. Note that the center section requires -1.14 dB coupling, and 195 ohms even-mode impedance. Good luck making such a coupler, unfortunately, just because you can conceive of something doesn't mean you can fabricate it. Note that we have "standardized" the ports as follows: Port 1 is input, Port 2 is direct, Port 3 is coupled, and Port 4 is isolated. Hopefully the rest of this website follows the same convention. Here is the 0.6 dB ripple response. 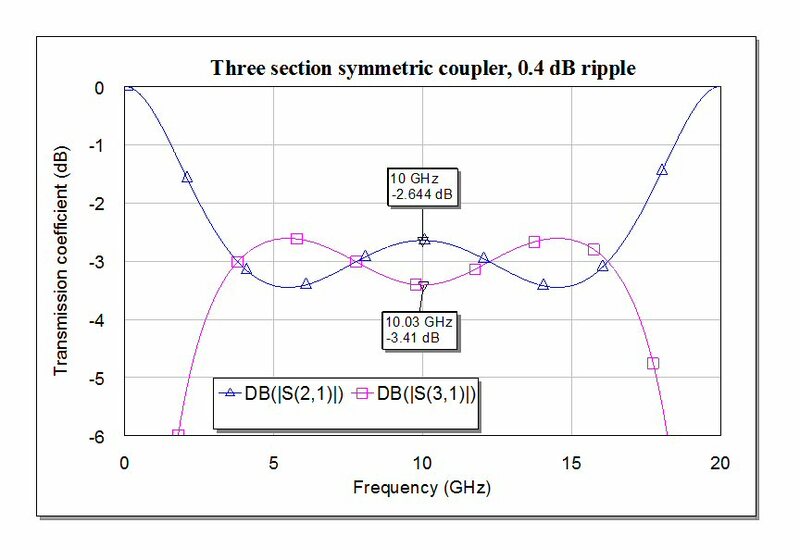 Note that "0.6 dB ripple" refers to peak ripple from ideal 3.01 dB split. The maximum difference between direct and coupled ports is actually 1.2 dB. This coupler has 146% bandwidth and would work well over the "classic" 6-18 GHz band. 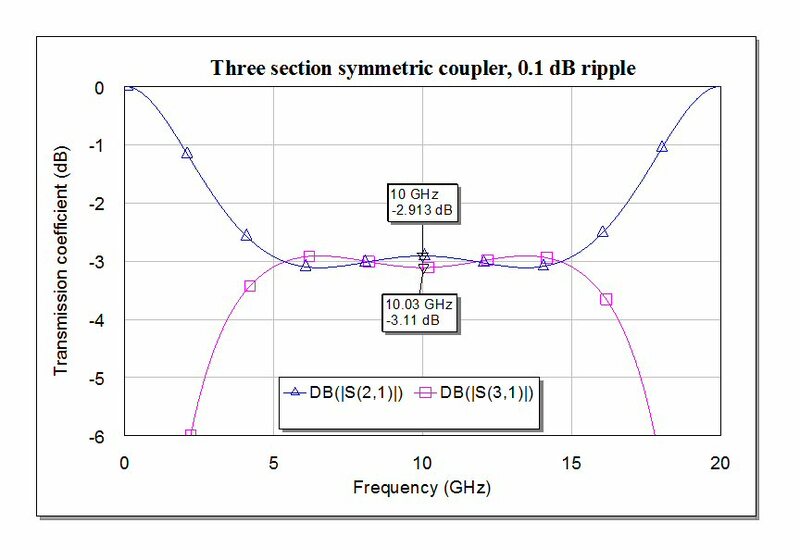 Here are the values for 0.4 dB ripple. Note the center coupler is slightly less coupled, but it will still be a problem hitting 183 ohm even mode impedance. This coupler has 135% bandwidth. Bandwidth goes down as you tighten the coupling requirement. Here are the values for 0.2 dB ripple. 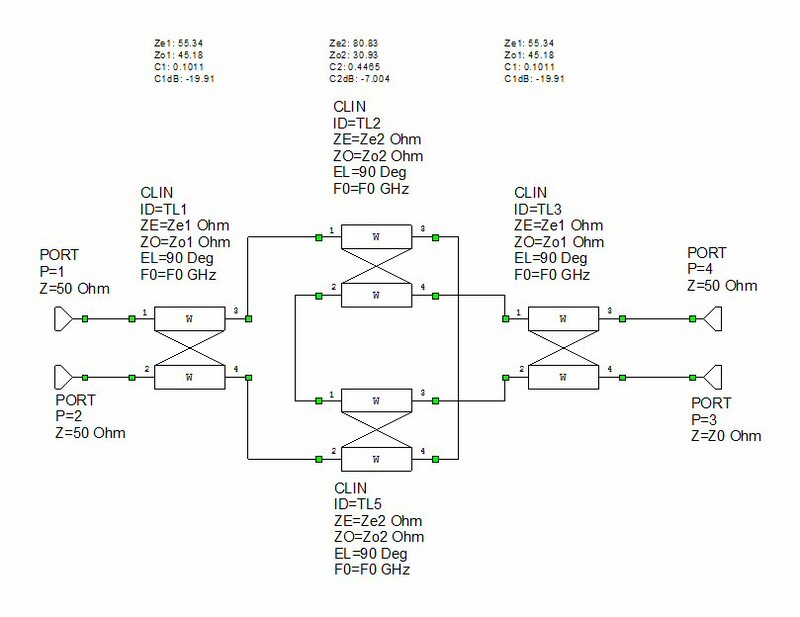 Hey, we should have just made a table instead of showing that same schematic over and over again. Doh! 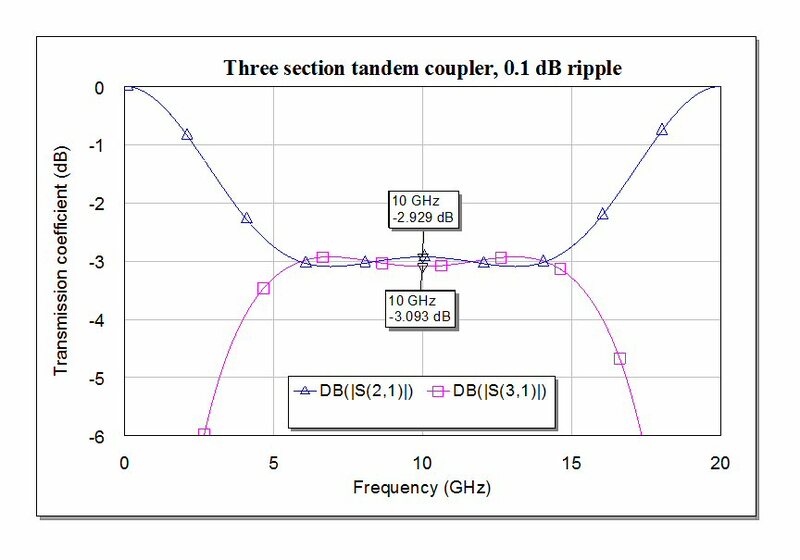 The 0.2 dB ripple coupler has 117% bandwidth. ...and here is 0.1 dB ripple coupler. Something you might want to consider: manufacturing tolerances will likely cause far more ripple than 0.1 dB. Also, why would you actually need 0.1 dB ripple? Now,let's look at tandemizing the coupler to make the impedances more realizable. First, we go to Mogia to obtain the impedances for 8.34 dB couplers. 8.34 is the magic number, when you tandemize it you will get equal power split. Here is the tandemized coupler, with 0.1 dB ripple impedance values. Not that we have maintained out port conventions below. Funny, Mongia's book did not maintain them in Figure 8.31... Note that all of the impedance values are more easily realized: you have an excellent chance of manufacturing this. Here is the response. 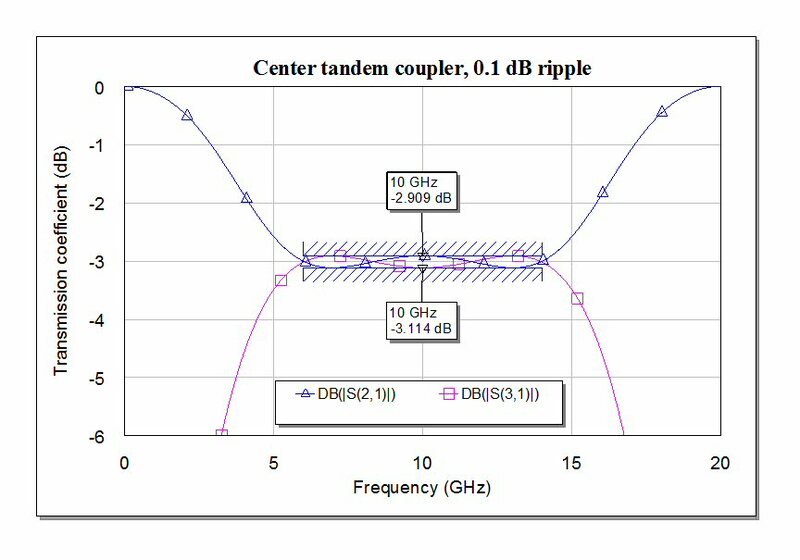 Note that the bandwidth is decreased from the "direct" 3.01 dB coupler with 0.1 dB ripple (the preceding example). It is less than 100%, we were to lazy to exactly measure it. We are not sure why it did not come out exactly 0.1 dB ripple, maybe there is some rounding error going on. Engineering is all about chasing things that matter, and not getting lost in the weeds. How about we just tandemize the center section? 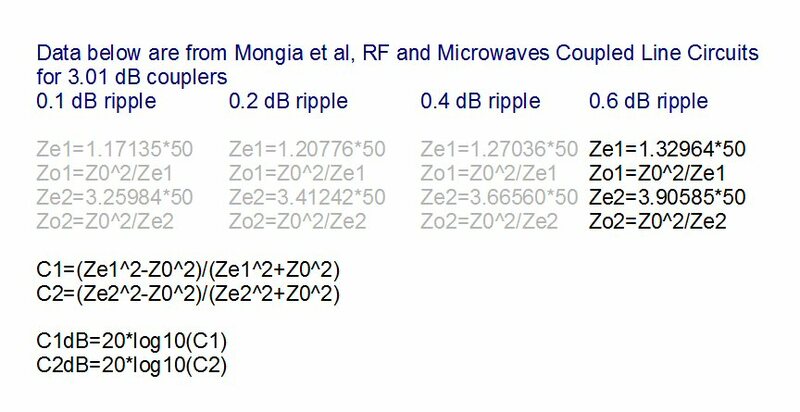 There is no solution for that in Mongia, so we use an optimizer to obtain 0.1 dB ripple. Below are the impedance and coupling values. Note that we have maintained our port numbering convention. The impedance/coupling values are easily manufacturable. The details of actually hooking it up are left to the student! So what can you conclude: making the coupler more manufacturable by tandemizing (and reducing maximum even mode impedance) takes its toll on performance. There is no free lunch here! As far as knowing what value of ripple is acceptable, it depends on the application. 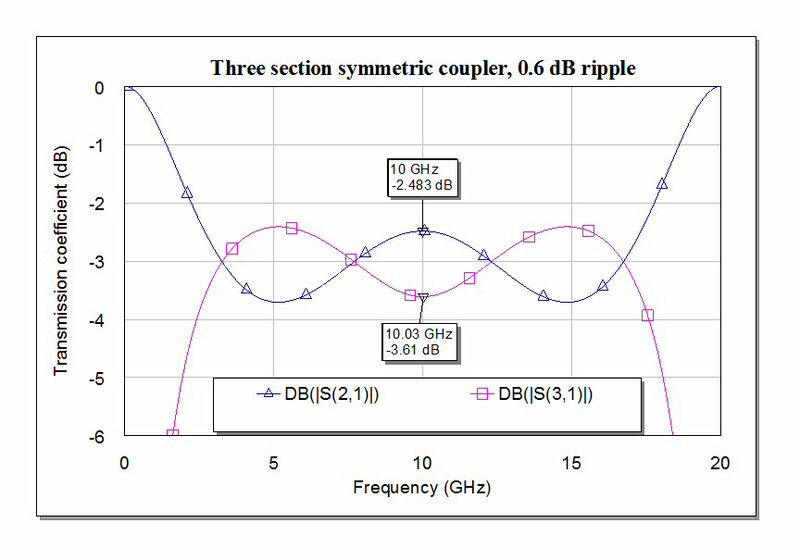 For broadband balanced amplifiers, 0.6 dB ripple would be fine; more ripple means more bandwidth. However, you should consider that you only get 100% reflection cancellation (perfect return loss) in a balance amplifier at points where the coupler provides equal amplitude split (3.01 dB in the ideal case). For more even bandwidth you can add more sections. Mongia has tables up to nine sections. However, you may encounter impedances as high as 7.5xZ0, which is pretty much impossible. Note that 200% bandwidth is impossible even with infinite sections, you will never couple DC signals. If anyone wants our three-section coupler MWO file to play with, just ask. We'll post it in the download area once it's cleaned up.